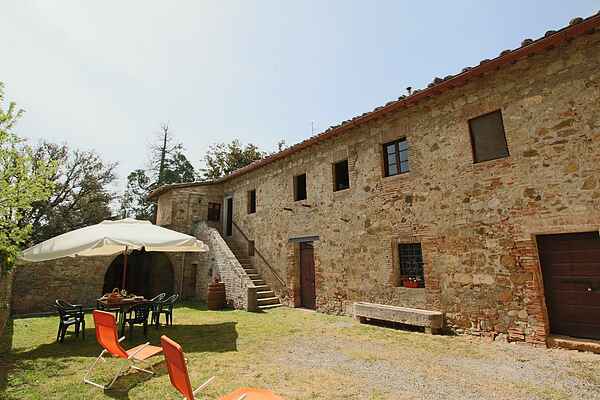 Bach is a rustic house next to a castle in 1465 on an estate in an idyllic part of Tuscany with elms, pines, vineyards and olive groves between the Val di Chiana and Val D'Orcia. The area is known for its production of fine wines and cheeses. The countryside surrounding it is part of the estate where Chianti wine and olive oil. Bach was once home to the staff who worked in the castle. It is a simply furnished house with a private garden and terrace where you can enjoy your vacation, there is a pool that is shared with the other rustic houses and the castle. Have a nice vacation in the Tuscan countryside. It is also possible to organize parties or weddings at the castle and manor houses (for 50 people).